This giant oak tree, has a waistline of 35 feet, a height of 52 feet and weighs an estimated 23 tons, has been here for about 800-1000 years. Legend has it that Robin Hood hid from his enemies inside the Major Oak. 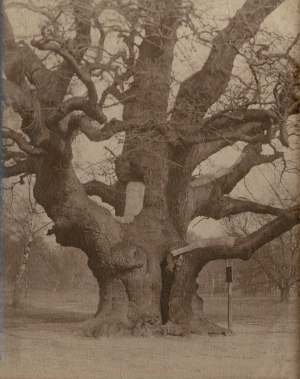 An undated winter time shot of the Major Oak in Sherwood Forest. Lead sheets, used for protection, can been seen attached to the top of the larger branches. They were removed in the late 70's and replaced with wooden struts, which in turn have now been replaced with slender steel poles.